This is a late post, but I really enjoyed Quebec City! I might have a post or two left for this charming place. After my friend's wedding, Kepi and I wanted to explore beyond Montreal. 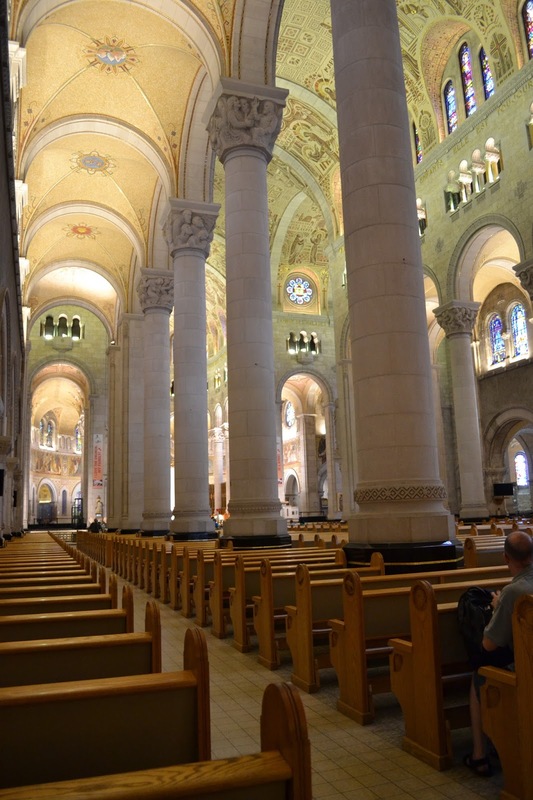 We drove to Quebec City and we truly enjoyed what this city has to offer. It was a refreshing site to see, and we enjoyed the walk from the Welcome Center to the waterfall itself. I would have loved climbing up there, but my body wasn't strong enough. It just dawned on me that I've lost so much muscle that it may take me a while to regain my stamina and strength. I heard that in winter, the rock faces of the cliffs on each side can get frozen and open for adventurous ice climbers. This is one reason I told Kepi I'd like to see Quebec City in the winter. The towering waterfall is 83 m (272') tall, a full 30 m (99') higher than Niagara Falls. 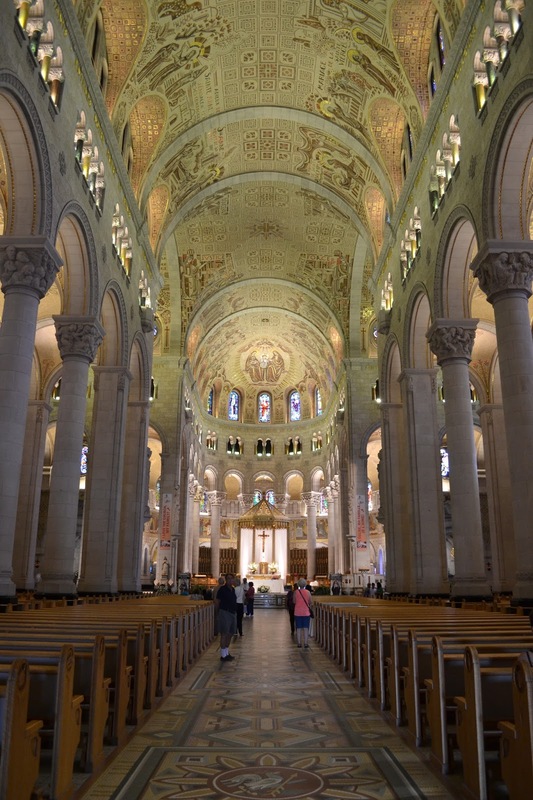 After Montmorency Falls, Kepi and I drove to visit Saint-Anne-de-Beaupre. 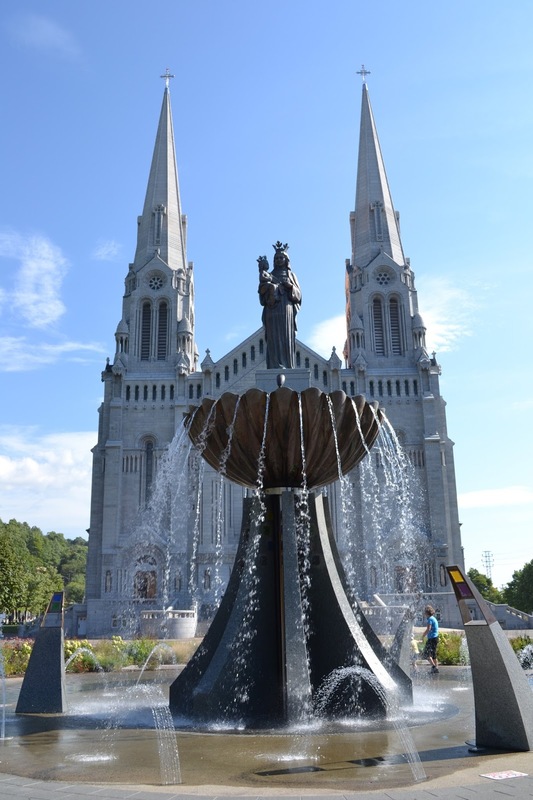 From Montmorency, it was a good 15 to 50 minutes drive to reach the shrine. It was so windy when we visited. But inside the church, I felt peace and calm. Churches and cathedrals have the power to make one feel small, but that's because it's true. In this vast world we live in, we are but just specks of dust. This room we found by accident at the lower level of the church. The ceiling looked like a blue sky with stars. It felt warm and cozy. There is so much to love and see in Quebec City. This province is in my bucket list. Oh yes, this place is worth the visit. From what I've seen of Quebec on the Travel Channel, it looks like a beautiful city. The waterfall is lovely. It's difficult to believe that this waterfall is higher than Niagara Falls. Both are lovely in different ways. Loree, Yes, it is one beautiful city. I'd really love to see this place in the midst of winter.